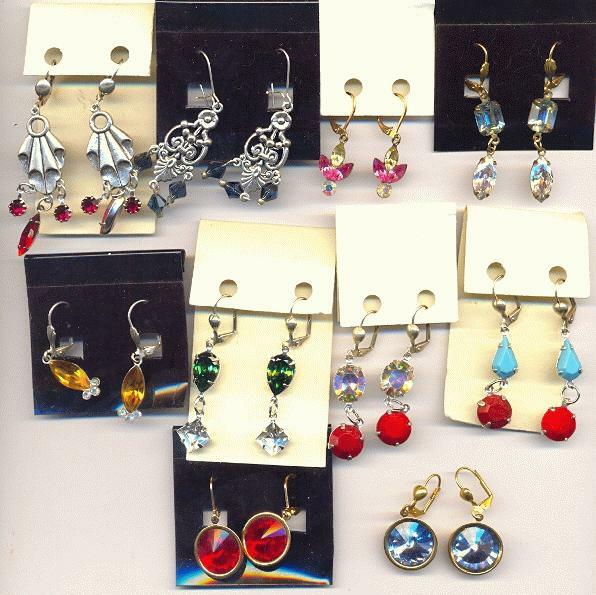 Price listed is for this entire mixed lot of Swarovski rhinestone earrings. There are a total of 10 pairs of earrings included. The picture shows a good view of all the earrings included. The earrings consist of lever-back style ear wires accented with Swarovski rhinestones. The rhinestones included are octagon, navette, pear, round and oval shaped. The colors included are aqua, topaz, tourmaline, Siam, rose, crystal AB, jonqil, turqoise and cherry red. Six pairs of earrings are silver plated and the other four pairs of earrings are brass. The earrings range in length from approximaetly 1 1/4'' to 2 1/2'' long. You could easily unlink the settings from the ear wires and use them as pre-set rhinestone charms or drops. Some of these earrings have filigree style charms attached.